Runways may intersect each other. The additional runways enable aircraft to land into the wind. Single runways can be difficult if there is a strong crosswind. Where there is only one runway, every effort is made to build the alignment in the direction of the prevailing wind. Runways are referred to after their compass heading. A runway's compass direction is indicated by a large number painted at the end of each runway. 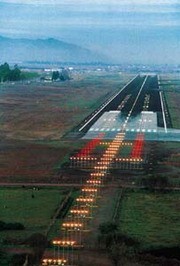 A runway's number is not written in degrees, but is given a shorthand format. For example, a runway with a marking of "14" is actually close to (if not a direct heading of) 140 degrees. This is a southeast compass heading. A runway with a marking of "31" has a compass heading of 310 degrees, that is, a northwest direction. For simplicity, the precise heading is rounded off to the nearest tens. For example, runway 7 might have a precise heading of 68 degrees, but is rounded off to 70 degrees. It is still good practice to check your compass prior to take-off or landing as it has been known that the numbers have been painted on the wrong ends! click on the runway numbers on the illustration below to see the direction that will be seen on an aircraft's compass when it is ready to take off. Occasionally there may be parallel runways. 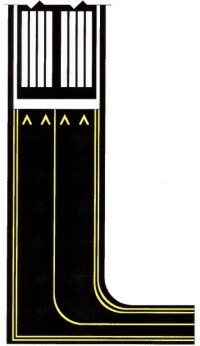 'L' and 'R' is then added to the runway number. Even more rarely there are three parallel runways. The central runway is called 'C'. 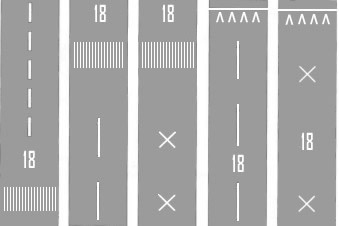 Below are shown typical runway markings. It is relatively easy to navigate around small airports, but large airports can be a nightmare for pilots using them for the first few times. Pilots can inform the ground controller they are unfamiliar with the airport, and request progressive taxi instructions. The ground controllers are happy to help newcomers. The airborne view of Dallas/Ft. 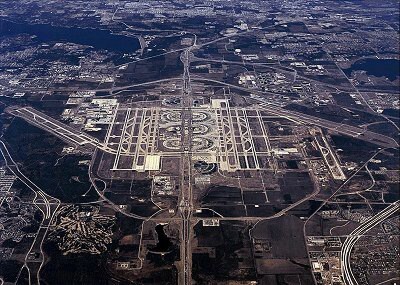 Worth airport will give you a picture of how complex and confusing a large airport can be to pilots who do not work out of DFW regularly. The view looking north shows nine runways and dozens of taxiways and high-speed turnoffs. Airports also use standardized lighting to provide direction and identification to all air and ground crews. To assist pilots in differentiating at night between airport runways and major roads, airports have rotating beacon lights. These beacons usually flash green and white lights to indicate a civilian airport. These beacons are visible from the air long before the entire airport is recognizable. more commonly, a two letter Morse ident. for the airfield is shown. Again, civilian fields are green. Military identification beacons flash red. To help pilots at night quickly identify the beginning of a runway, green threshold lights line the runway's edge. Red lights mark the ends of runways and indicate obstructions. Blue lights run alongside taxiways while runways have white or yellow lights marking their edges. All these markings and lights serve to set a safety standard for all pilots to follow.